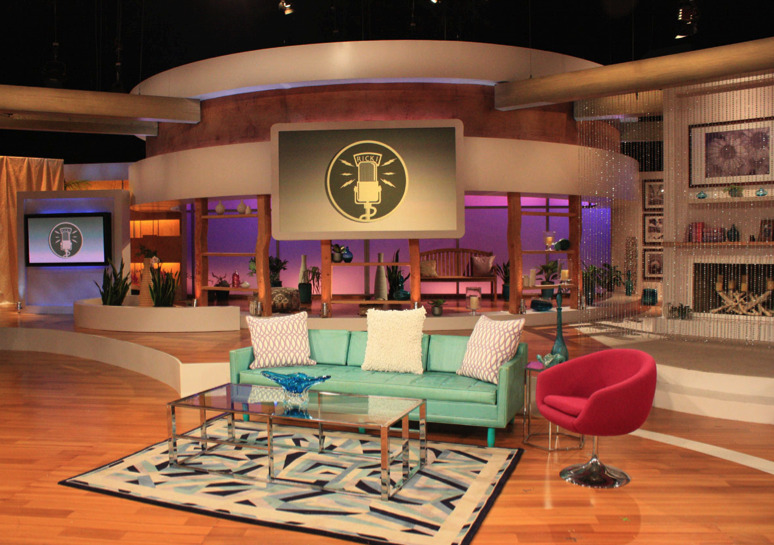 Hot off the Set visits star Ricki Lake and Set Decorator Regina O’Brien SDSA for television’s hottest new talk show! 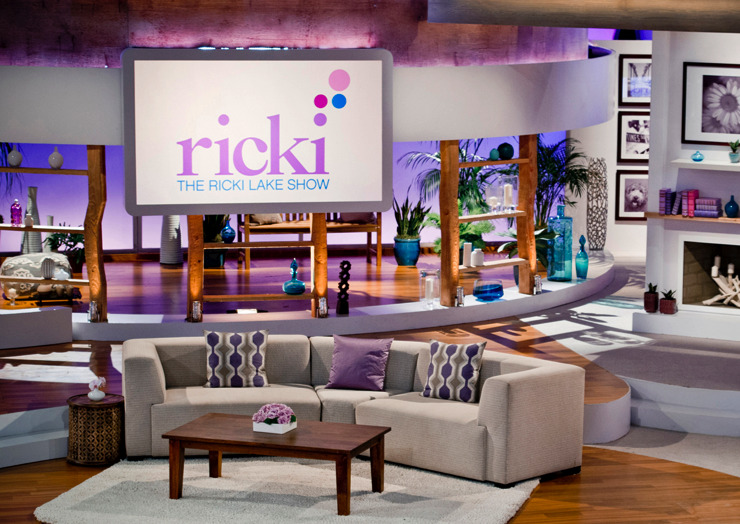 Ricki shares her thoughts about the show’s décor, and Regina answers questions about decorating for “talk” and specifically, for THE RICKI LAKE SHOW, with its gorgeous, fresh and fun main set…plus all the changeovers a talk show with a live audience requires. She also generously shares her resources for some of the great pieces she’s placed on the set…so check it out! Photo: Ricki Lake, THE RICKI LAKE SHOW©2012 FOX Broadcasting. All rights reserved. 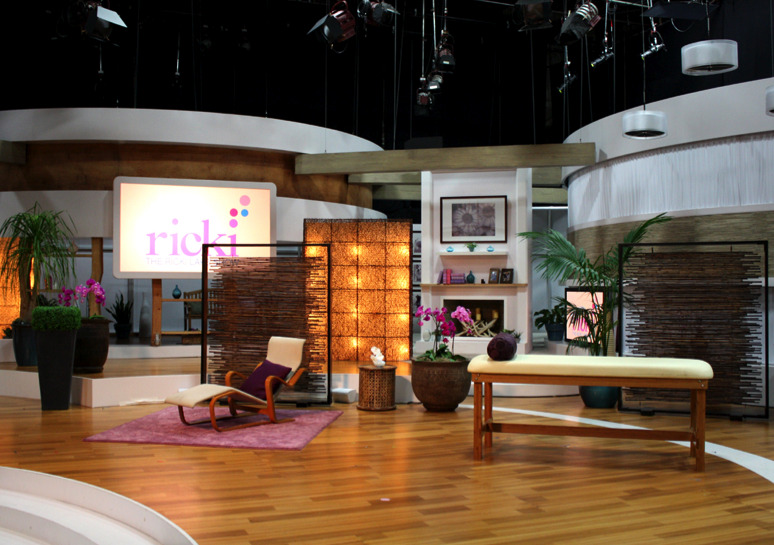 Ricki Lake: Truthfully, the set perfectly matches my sensibility. It's warm and comfortable and feels extremely inclusive. I like my guests and audiences to feel like equally important parts of the conversation, and the design is really conducive to that. What does the set say about the show? 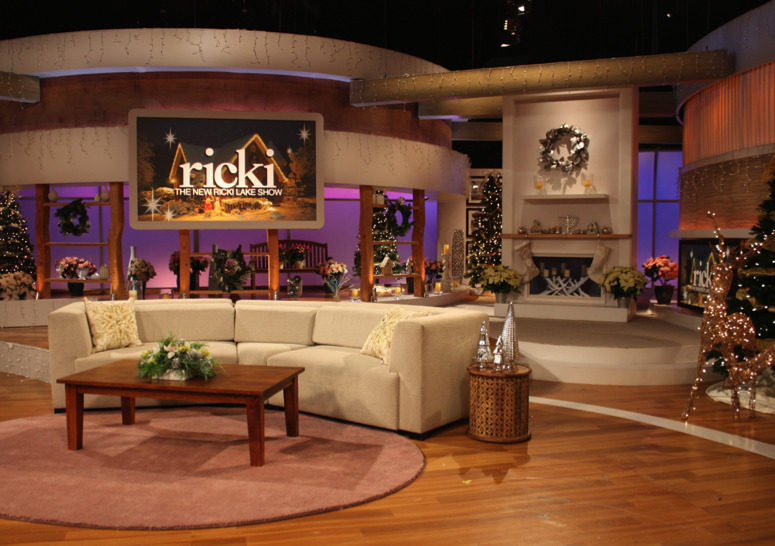 Ricki: I think the set and the decor tells viewers that they have joined a forum for elevated conversation -- a place that's at once upscale and comfortable where there are no judgments. What was your reaction the first time you saw the completed set? 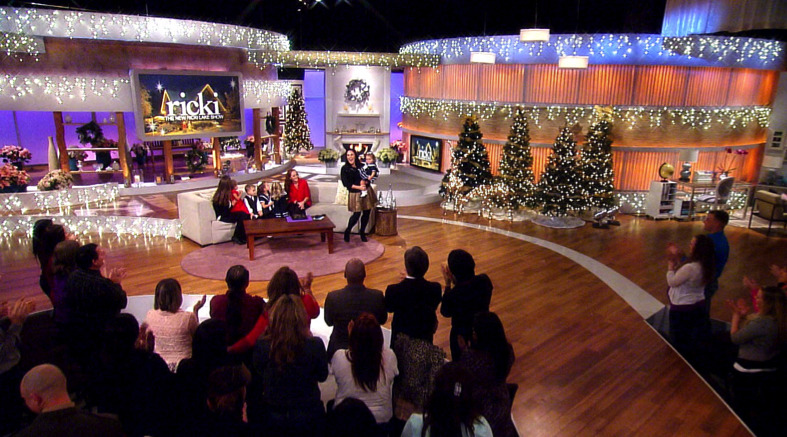 Ricki: I was blown away when first saw the set. It just felt so inviting, and it gave me a sense of home. It was exactly what I had envisioned. There are personal elements/references on the set. Could you tell us about those? Ricki: It wouldn't feel like home to me without pictures of my husband and kids. 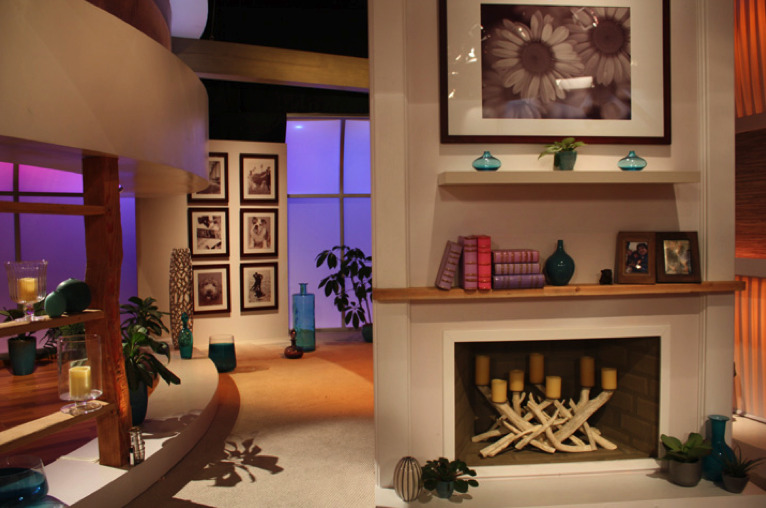 Is there an element of the set dressing – furnishings or accessories – that you would like to actually take home with you? Ricki: I actually love the couch and the rug under the coffee table. Hopefully, Regina won't notice they're missing when I decide to have them transferred to my house! How much do you get involved in determining the look of the set? Ricki: I know I am in very capable hands with Regina O'Brien. She knows my style and has a terrific eye for decor that I like. I definitely give some input if there's something specific I want to include, but Regina hasn't disappointed! Regina is fantastic! She has such a good energy and is unflappable. She, Prop Master Ann Nord, and her Assistant Don Rosemond have done some amazing decor -- I particularly love the work they did on the "Bad Holiday Sweater Show" and the "Vintage Fashion" episode. Photo: ©2012 Regina O’Brien. All rights reserved. Set decoration involves visually creating a back-story for the audience. Set Decorator Regina O’Brien SDSA: The set for the show was always conceived as Ricki’s “home away from home”, and to that end we tried to create spaces that were abstracted elements of a home…a Living Room, a Sunroom, a Foyer and a Fireplace nook. When the Production Designer Anton Goss originally met with Ricki at her home, they discussed her favorite color, purple, and her love of driftwood. Those two elements became the backbone of the design. What did you have to take into consideration that you wouldn’t normally deal with on a regular series? Regina: Talk shows are so much more focused on conversation, with lots of two-shots and singles of guests. Aside from making sure that a plant isn’t growing out of someone’s head, I always have to be aware of what is happening behind our guests, and be prepared to make little adjustments so the composition around their face is pleasing, and the color blocks balanced. We also need to be aware of the space compression that happens on set, where dressing that seems physically far away, appears to be right behind people on the couch! Fortunately both our Director Manny Rodriguez, and Executive Producer Gail Steinberg are seasoned pros and always have great ideas about how to make the show look it's best. I am very fortunate because our entire crew is top notch, and that makes my job so much easier. Photo: ©2012 FOX Broadcasting. All rights reserved. Regina: The mantle has some personal pictures of Ricki on her honeymoon, and a cute shot of her kids, and a little sculpture of a bulldog. I wanted to do a floral print over the mantle that was identifiable but a little bit abstracted. I was able to find an image of Chamomile, Ricki’s favorite flower, that works well. The photo gallery in the rear entry hallway behind the fireplace is also personalized to Ricki. We have a picture of a couple dancing (a reference to DWTS), a photo of a Bulldog (her husband Christian’s dog) and one of a Golden Doodle (Ricki’s dog), a picture of Times Square to honor her time on Broadway, a vintage shot of Santa Barbara (where Ricki got married), and a wedding album shot of the happy couple running on the beach. All of the photos were desaturated of color and printed with a slight purple hue, so that they would blend themselves into the space. The books on the mantle were intended to be a visual wink at old tomes. I had a scenic painter paint and detail porcelain books in five different shades of purple and then give them a little aging to look worn-in and well-read. Regina: One challenge on a show like this is to get the look of a lot of space and depth, where there really isn’t any. Open shelves work well for that. I try to fill them…sparsely…with items that are more shapes and colors than descriptive pieces. Additionally, since we have to provide many different entrance and exit points for the segments and guests, each should look individual in its architecture and feel. Natural wood (humble plywood) cut into a patterned ribbon, with a recess for light, also works well to make the set homey. I have used patterned round wood tables (the sofa side table and a plant stand in the Sunroom) to echo this backdrop of wood. Additionally, there are several light wicker baskets, a wooden garden bench and cutwork chests that help with the feeling of openness and light. Regina: The ideology for the entire set was to keep everything soft, light, curvy and sensual using bright pops of color (blues and purples) and glints of light (glass works well for this), to define the different areas of the set. For example, in the entry Foyer (our celebrity entrance), I’ve placed a beautiful lavender Indian inlaid-bone console that has shape, color and pattern. The practical standing lamp reminds me of a Mae West dress…sensuous white and ribbed. The small chrome floor can lights were selected by our great DP Tim Anson, who uses them to put a little uplight on the sandblasted columns. Additionally, the chrome gives a little pop. Photos ©2012 FOX Broadcasting. All rights reserved. Regina: It is very important to have an intimate atmosphere where guests can feel they are just talking to Ricki in what feels like a living room, and be able to open up to her. We needed to have a sofa that was curved without looking like it, and the key to that is a wedge section in the middle of the sofa. The sofa is custom made, the fabric a neutral beige. Not white! The camera and the DP don’t like white, since it tends to blow out on the screen. The pillows work well because they are in our color palette of grey, beige and purple, but also have a simple geometric that continues around the set. The sofa side table has a great cutwork pattern and African feel, in a natural wood tone. We ended up changing out the original white rug under the couch…which created a problem every time we moved the rug or couch, which was all the time…and replaced it with a custom-made lavender rug. Anton and I are very particular about floral arrangements, and prefer small arrangements of a limited color palette, usually a single type of flower with some green element for a clean, simple look. White vases work well for this. Sandy Rose makes our wonderful arrangements with just the right blend of simplicity and flair. Photo: ©2012 Regina O’Brien,. All rights reserved. Regina: The pouf in the Sunroom has the cream and grey color neutrality I love, with the geometric pattern that gives it a little zing. I wanted to put a tea set by it to evoke the feeling of relaxation. This one has a lovely earthen tone. The pillows on the garden bench are, on the left, a muted velvet paisley, and on the right a lavender silk. I like live orchids on set. Even the most expensive silk ones just don’t look the same, so every month or so, I go down to the flower district and buy fresh orchids very inexpensively. The lacy, open look of palms makes them perfect for the set, and they remind me of Victorian parlors, so that is fun. I have also selected variegated plants to provide some pattern and openness. Fortunately all of these plants don’t need a lot of light and can tolerate our stage fairly well, which is kept on the cool side. Photo: Regina O’Brien. All rights reserved. Photo: ©2012 Regina O’Brien All rights reserved. …a Spa complete with massage table. Photos 2012 Regina O’Brien. All rights reserved. Regina: Art Director Dylan Jones and I selected the audience chairs, chosen for their medium size, nice brown color and high comfortability. We do have furniture at the back of the audience seating, a small table and some orchids and vases. We also needed to dress a camera blind (a short wall to cover one of our cameras) with a white wooden console, two beautiful matching blue fluted jars, and a ceramic cutwork pot purchased at Olvera Street. What about the fab stools used onstage when there are multiple guests? Regina: The stools that we use almost every other show were originally purchased as a pair, which I selected because they had a beautiful Driftwood-esque wooden base. I then re-upholstered them in a slightly purple light brown leather-stamped vinyl fabric, which was easy to clean if need be, and looked great with our set. Soon we needed 2 more, which I scrambled to find…and then we needed an additional two! After scouring the country for the fabric (and just barely finding enough), I had to have the last two chairs made. But it was a good investment, since we use them on a regular basis for panels, performances and demos. I did have to have a footrest added later, so that gals in heels, including our host, could have something wide enough to set their heels on. How often does the show shoot? Are you there for the shoot? Regina: We shoot 6 shows a week at 1:00pm and 4:00pm, on Tuesday, Wednesday and Thursday. Sometimes we have a third show on Wednesday. I usually watch the show on stage and am there to make tweeks with our Propmaster Ann Nord. If I have to be in my office, I watch the show on the live feed there. One of the many aspects of set decoration is problem-solving. Could you give us an example?!!! Regina: Since we have a studio audience when we’re filming, there are noise considerations that I have rarely needed to address in the past. The set was originally built with a hanging wooden flat at the back of the set, but in practice this ended up acting like a drum that created a feedback echo. To solve that problem I had a curtain made by Dazian. I had the graphics of our “Ricki” logo stretched horizontally by 25% to compensate for the fullness (folds) of the drapery when hanging. This curtain hangs in front of a line of custom-made acoustic panels (also made by Dazian), and this seems to have solved the problem. What’s the most unique about this set/show for you as a set decorator? Regina: One of the greatest challenges of the show is addressing the changing (and often last minute) needs of our Segment Producers, who are making alterations to the show right up to show time. I need to fulfill their wishes while staying within the stylistics of the show. And I always try to keep the set looking fresh. Besides the Living Room rug and the acoustic curtain, were there other significant changes that you had to make since the original concept of the set? …And since starting shooting? Regina: Additionally we needed to change out a section of beige carpeting for wood, and added a white stripe to delineate the separate spaces, so the cameras could move around more freely. The wood flooring is actually a painted faux floorboard that has been coated with a special non-streak coating for durability. Is there something specific in your past experience that really came into play or helped for doing this set? Regina: I’ve done a lot of commercials, and I think that helped me be able to move quickly on last minute requests. And because I am the head of the Art Department on staff, I have sole input into our day-to-day design decisions which is a big responsibility, but also a chance to be really creative. Fortunately, what I learned about space and design in architecture school helps inform whatever comes up…as does everything else in life! Photo: Lisa Loeb, Tia Mowry and Ricki Lake, THE RICKI LAKE SHOW©2012 FOX Broadcasting. All rights reserved.